Thursday we made our way from Pristina (in the South of Kosovo) to Mitrovica (North Kosovo). We had an early start and left Pristina around 7h30 from our usual meeting point, Newborn (but of course, we had a much needed coffee stop before getting on to the bus, as most of us, including Anne, were falling asleep whilst waiting!). 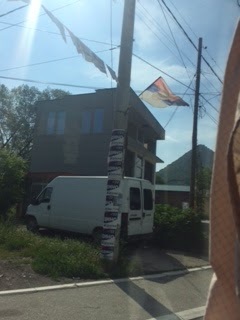 We travelled in a UN minibus (very cool) however I was wondering what local people would think as there is a divided opinion on the (huge) international interference in Kosovo. However, as far as I saw, there were no strange looks ! Our first stop was about 20 mins out of Pristina: the famous monument at the Field of Blackbirds. This was where, in 1389, the different ethnic groups (Serbs, Albanians...) fought a battle against the Ottomans (however, the Ottomans won). This was interesting as it was a battle that the two groups fought together but the monument seems to be directed at Serbs as the messages on the memorial is only written in Serb. We then got back into our little bus and made our way to Mitrovica. First of all, the countryside was very green and filled with little dispersed villages where there were lots of newly built mosques. This was very interesting as Kosovo is known for being quite a secular Muslim place. Peppi (who I was sitting next to in the bus) stated that this might be a reaction to the increasing anti-Muslim feeling in Europe that we are seeing at the moment as people tend to assert their identity more when they are being othered and excluded. Another thing I noticed along the way was the amount of houses that seem to be under construction/half built. Anne explained that most of the time this was because Kosovar Albanians are waiting for the Albanian diaspora (that fled during the war to settle around the world) to send them remittances so that they could continue little by little to build the next part of their houses. I also saw different memorials along the road for war heroes with fresh flowers meaning that people still go there to replace the old ones. This shows the importance the Kosovar Albanians give to their war heroes. Finally we were approaching Mitrovica. 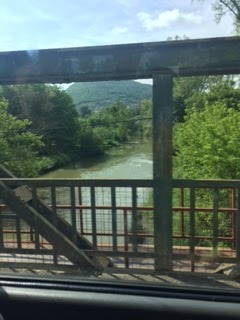 We crossed the bridge into North Mitrovica (across the Ibar river) and all of a sudden the signs were in written in Albanian and Serbian, the licence plates were Serb and the Serbian flag was hung everywhere along the side of the roads and on houses and we all got messages from our phone companies saying 'welcome to Serbia'. Anne explained to us that often when road signs were in Southern Mitrovica (majority Albanian) the Serbian words was crossed out and in Northern Mitrovica (majority Serb) the Albanian words was crossed out.